Pura Vida ... The staff was extremely friendly. They even cut me a deal when I didn't make my return flight home. The private rooms were very nice. It's a little further away than the other spots, but this one seemed to have better upkeep. 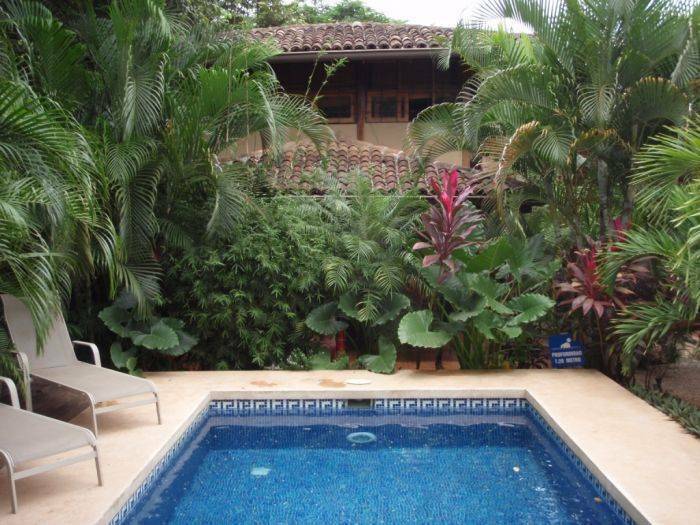 This beautiful Hotel and Five Star Hostel was built in 2006 and contains the largest rooms and cleanest facilities in Tamarindo. The Chocolate Hotel and Hostel has 9 comfortable apartments that cater up to groups of 7. The apartment like quarters have private balconies and hammocks which overlook a well maintained pool and tropical garden. Dinning Areas, Air Conditioning, Cable TV, New Mattresses, Private Bathrooms with Hot Water and Fully Equipped Kitchens. Concierge, Security, Internet Cafe, Fast Computers, Free WiFi, Laundry, Swimming Pool, Tour and Transportation Booking. Each dorm includes a full sized kitchen with cooking range, large refrigerator and coffee maker. Private suites contain the same and are also furnished with a large couch that sleeps an addition adult or child so you are able to bring along the entire family. Our pricing is competative and affordable. Daily, weekly and monthly rates are available. Please contact us via phone or email to confirm vacancy. Wether you are a novice or experienced traveler, you will enjoy your time at The Chocolate Hotel. Besides, why rent a room when you can have an apartment? Our rooms have ac, cable tv, wifi, kitchens, bathrooms with hot water and patios with hammocks facing our pool. WE have the nicest facilities in town .. the building was built in 2004, we are the only 5 star Hostel in town. Air Conditioning , Hot Water, cable in all of our 9 comfortable apartments . Some have private twin and double beds, dormitories All have balcony's/ private patios overlooking the pool and tropical garden. Hammocks , full outdoor teak dining tables. Please see our facebook fan page for accurate reviews from our loyal customers. Just search "the chocolate hotel" and click the "like" icon. Please note that any electronic transactions are subject to Costa Rica's sales tax of 13. 39%. The Chocolate has a social area, pool, hammocks, internet cafe, parking lot, security cameras and a jungle canopy setting. 24-hr front desk Air conditioner. Airport pickup BBQ area Bar/lounge Beach Breakfast (extra charge) Cable TV. Car rental Childcare or babysitting Children permitted Concierge Currency exchange Daily maid service. Elevator/lift not available FREE INTERNET CAFE AND SOCIAL AREA >>> WE HAVE COMPUTERS FOR YOU TO USE Free local phonecalls Fully equipped kitchen. Gardens Gay friendly Group services Internet access Internet wireless (free) Laundry/valet service Linen included Linen rental Multi-lingual staff Newspapers/magazines Nightly security. No curfew Open 24 Hours Orthopedic mattresses. Parking (free) Pets allowed Pool (outdoor) Private bath with hot water. Restaurant on site Room service Safe deposit box Smoking not permitted Taxi service Tour/sightseeing assistance Voltage converters WIFI (free) Wireless internet service. Our hotel is located 400 meters from the beach and set in a jungle canopy. We have howler monkeys in our trees almost daily. While here, you will also see iguana, geckos, many birds and butterflies. There are a lot of insects, especially mosquitoes in Costa Rica. Please bring insect repellent and the strongest sunblock that you can find. Local gym across the street with Yoga classes. Breakfast all day. New Restaurant Location. Authentic Costa Rican food with delivery. Authentic ItalianPizza Bar. Very Good. Mediterainian Cuisine. Best Gourmet Food. A 50% deposit is required to confirm reservations. Deposits are refundable up to 1 week before your check in date. No shows will be charged for their whole stay up to 1 week plus CR sales tax of 13.39%. Sales tax wilol be added to any electronic transaction. We are located 200 meters (a 10 minute walk) from the main beach, commercial centers, restaurants and bars. From the airport in Liberia, you can take a public bus or taxi which will get you here in about an hour. Taxis cost around $35. If coming from San Jose, the Alfaro bus company offers daily service from San José to Playa Tamarindo at 3:30 p. m. for approximately US $8. 00. The Alfaro bus station is at Barrio Coca Cola, on calle 14, between avenida 3-5. The bus ride to Tamarindo makes several stops and takes approximately 7 hours. As this is a public service, reservations are not available and you must purchase your ticket personally as early as possible. If you decide to use this service please keep your belongings close to you and in your sight at all times as this is not the safest way to travel. We highly recommend using a private bus company especially for novice travelers. Private bus companies have nicer vehicles, hold less people, are equipped with air conditioning and take about 5 hours to get to Tamarindo. This is a much safer and more comfortable way to get here. Please contact us via phone or email for more information or if you would like us to make you a reservation. The private bus cost around US $35 per person and departs near the San Jose airport. Free shuttles will take you from the airport to the private bus pickup point. Make sure that you change money when you arrive but use the station after customs and not before because the exchange rates are different. Upon arrival, inquire at reception about discounts for local tours, rentals and restaurants.